Where is Joyn really deployed and in what way can I benchmark approaches and business models ? What is Joyn? Joyn is an end user communication tool with instant messaging, video calling, file transfer and fully integrated in the device and network subscription. Also, Zain(with mobile operations across eight markets in the Middle East and North Africa) is launching pilot Rich Communications Services (RCS) in its home market of Kuwait too. Planned deployment at: AT&T, Bell Mobility, Bharti Airtel, KPN, KT, LGU+, Orascom Telecom, Rogers Communications, SFR, Telecom Italia, TeliaSonera, Telus and Verizon. Also in the this matter, accreditation by GSMA is an ongoing process that can be reviewed at http://www.gsma.com/rcs/interoperability-testing/accreditation/. The metrics are defined but not all the client applications are accredited. I thought in Korea, SK partnered with KT and LG to launch an interoperable messaging service, not a standalone service of SK. Please clarify. I've made some digging around it to and LG U+ has this service available in Android Market but I haven't anything else for KT (besides the news @ http://www.telecomengine.com/article/south-korean-operators-launch-joyn). 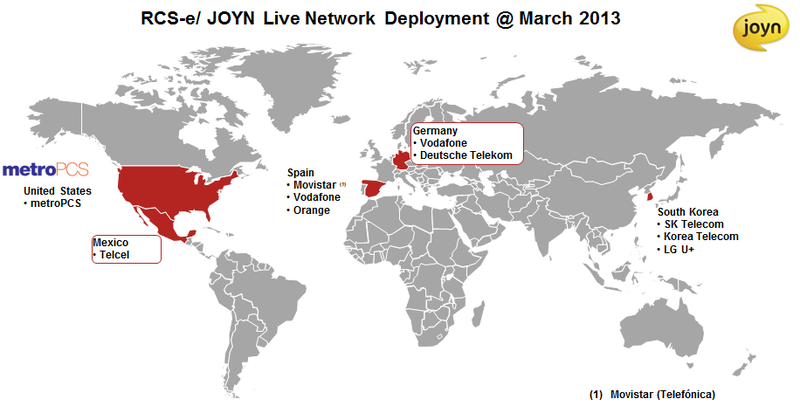 Also, some operators launched Joyn without a full accreditation and not guarantee interoperability testing (let's see how the market responds to this). RCSe Joyn is a "standard" and has set of guidelines for matching interoperability. GSMA has a list of accredit operators/ networks, equipment vendors and client application developers (WIT, LG-E and Sony Mobile). 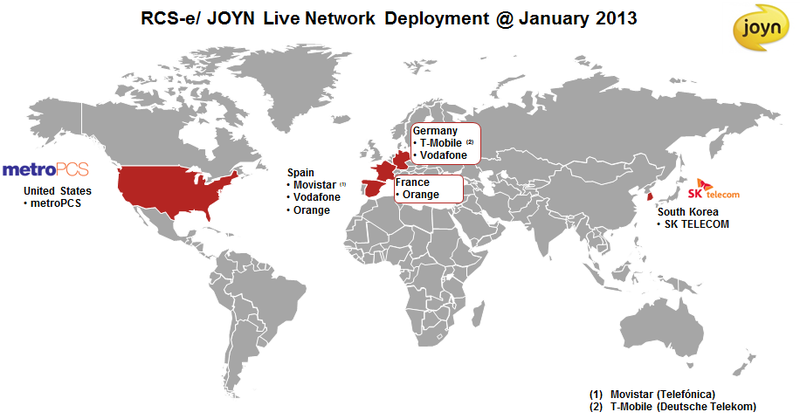 It is clear in their PR that the Korean operators are planning to use reach, through joyn interoperability and SMS interworking, as a differentiator. Less clear are the timelines for realising interop, with Korea Telecom claiming that “joyn will be interoperated across the three major carriers from the start [December 26 2012]”, but the SK Telecom press release stating it still “plans to link joyn.T with RCS services of other Korean carriers [in 2013] to enable all mobile customers to enjoy enriched communication”. A very compelling element in the Korean offering is the joyn interworking with SMS (for chat) and MMS (for file sharing), enabling early joyn adopters to interact with everyone in their address book from the start, whether the other user has joyn or not. The only down side of the Korean approach seems to be that they have chosen to implement this interworking capability in the joyn client as opposed to in the network. This may make it very difficult to ensure a predictable and configurable user experience, leaving it up to handset / client implementation and radio conditions whether a certain message is delivered in the SMS inbox or in joyn chat.